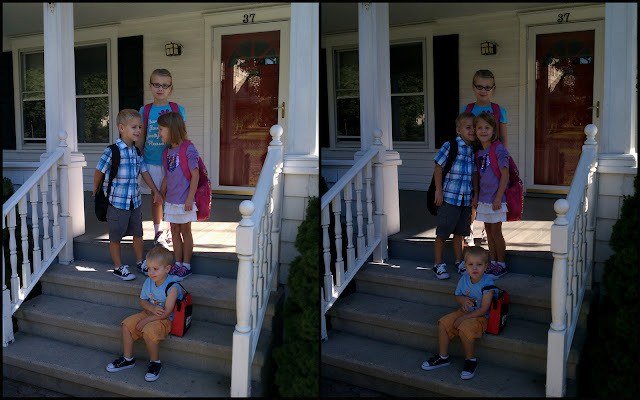 Three years ago when I had four kids ages four and under, I could barely imagine the day when those little ones would go off to school. Even with all the chaos that has been my life, I've had mixed feelings about sending my babies to school because (most of the time) I really like having them home with me. They play well together (most of the time) and they're starting to be really helpful around the house. They are funny, and cute, and we're sort of getting to a really good place in life. But alas, since I have no aspirations for home school (I'm even struggling that I committed to do "JOY" school once a week) I had to send them off to school. 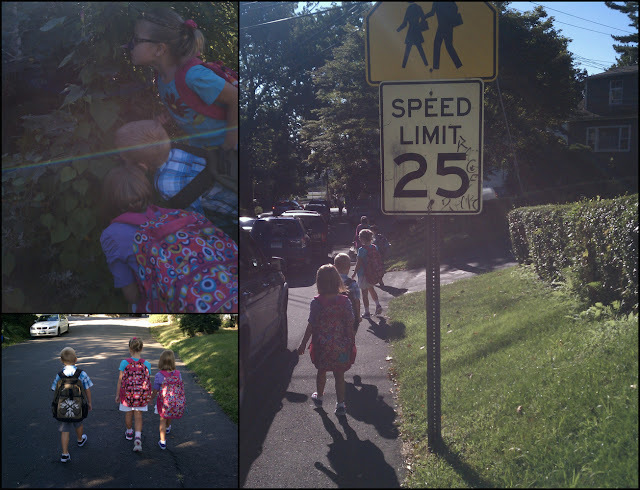 If you take out the extra stress of trying to get them out the door 15 mintues faster and the incredible out-of-shapeness of their mother, it was a pleasant little walk to and from school (uphill both ways!) The kids even found time to stop and smell the "roses" on the way. Abby and Zack LOVE Kindergarten. Abby had a little panic moment when I tried to leave her the first time but by the time I talked to Zack's teacher and then peeked in her room, she was making friends and happy. That night as I was putting her to bed she told me that she decided she would show up with a smile and be the teacher's helper! She totally has. For the most part, Zack's been a champ. However, he seems a little confused about why all the teachers keep calling him Zachary. I just can't believe they're really in school. As we walked away I felt that lump in my throat. 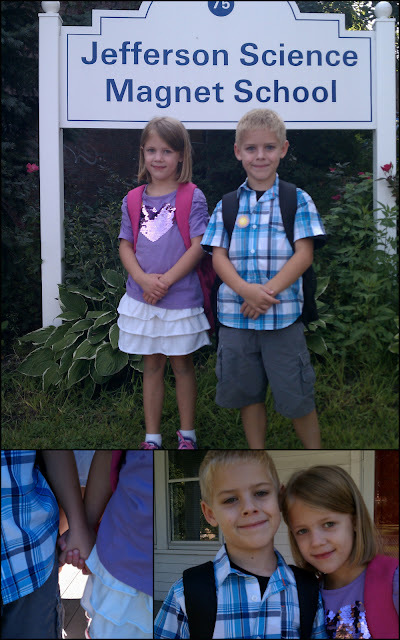 I know it's cliche, but they really, really do grow up so fast! Lila is thrilled to be in second grade (even if she doesn't look "thrilled" in this picture!!) 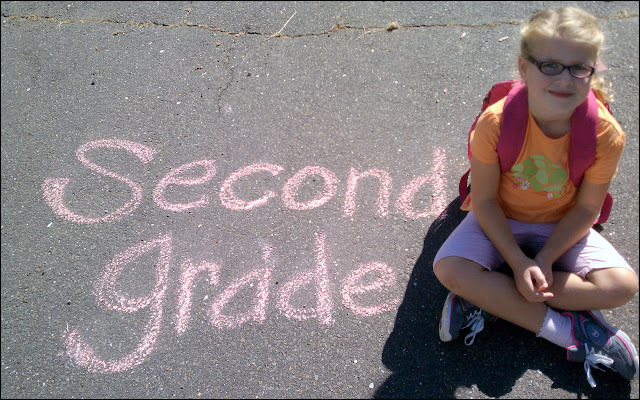 This is the first time she has stayed at a school (we moved after preschool and kindergarten) so she feels right at home. We walked into her class and her best little friend Mia came running up and gave her a huge hug. She is excited they are in the same class and she thinks it's incredibly cool that her teacher is on maternity leave. We're also trying to get back into the habit of homework. Lucky for me she enjoys it. I'm kind of jealous though. I wish someone would tell me I had to read for 25 minutes everyday! 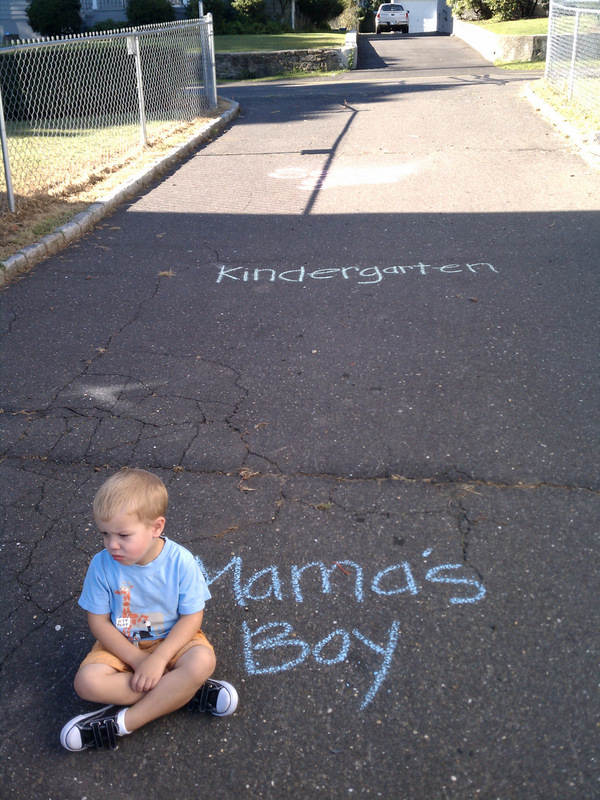 So far he still pulls that sweet, pitiful, incredibly adorable, sad, pouty face every morning when we drop them off. Looks like it's just you and me now, kiddo. What do you think of that? Emily, that was an awesome blog. I bet Alex IS so lonely. 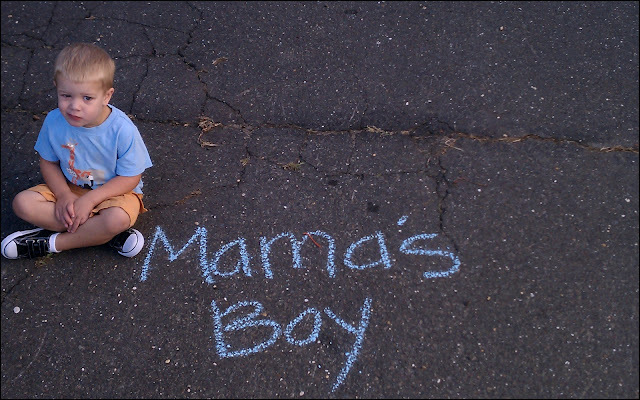 It's been said, "No one is more busy than a Mother of one." We'll see if that's true for you. I was wondering...how can your walk be uphill BOTH ways? Is it also down hill in some part both ways? I loved my time alone with Lizzie. So fun and special. Alex had never had you all alone. Enjoy! So happy and sad all at the same time! If Alex is ok playing with GIRLS, then Lillian (alone herself) and I would love to get together. Best of luck on the van situation! haha.. last comment was from me. Guess the hubs was logged into my computer! I loved reading about how they are liking school. Your kids are so cute! I love you all so much. Trust me it stinks watching all your older brothers and sisters go to school, and you have to stay home alone (I know mom is there but...). Then for me at least, the day came when I had to go to school and I wished I could stay home alone with Mom again. haha! love the pictures - but my favorite is that you put quotations around the "JOY" in joy school. hilar, Em. That picture of Zach and Abby makes them look like they are in middle school. I can't believe how old they look. Why can't we still be neighbors? I can't imagine what it will be like to have more than one home! 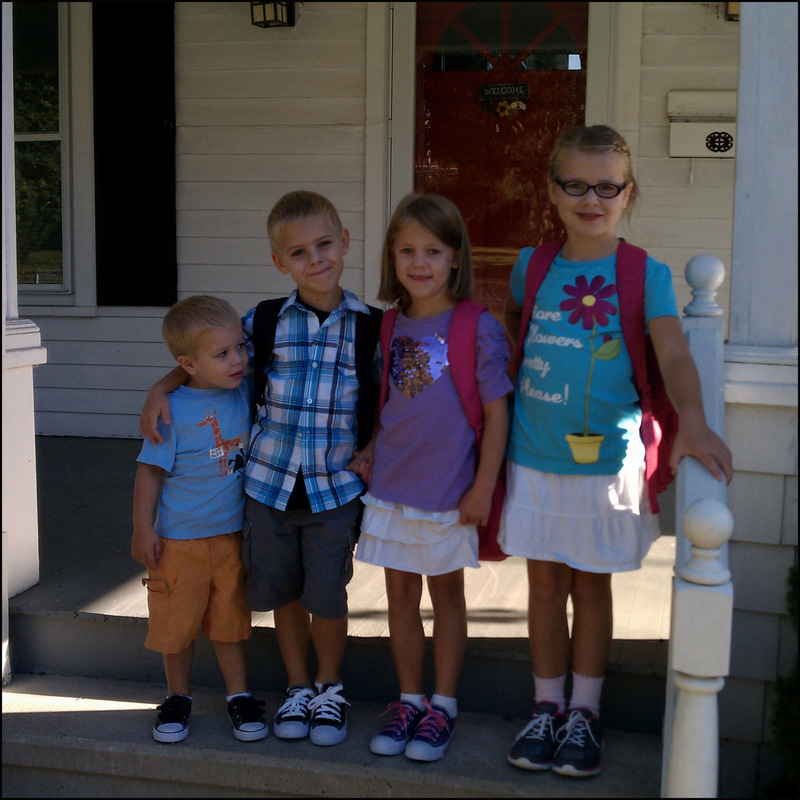 :) Darling kids! 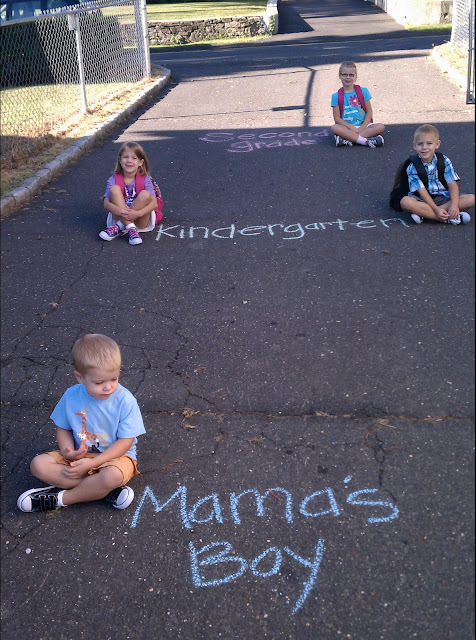 I am totally doing the sidewalk chalk next year. Sorry for stealing all your great ideas!! I know a great patent attorney if you every want to patent one of these great nuggets. Give the kids hugs and kisses from us and I'll let you know when we will be stopping by on our way to New Jersey.